Welcome to the Vintage Wine Bar! Neighboring the romantic Northern Italian restaurant, Chianti, the Vintage Wine Bar offers a stylish, inviting setting wherein one can enjoy a spectacular selection of wines from around the world. By the glass or the bottle, the vintage wines serve as the perfect complement to the appetizer menu. 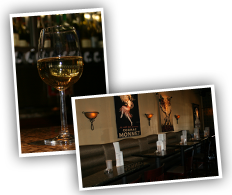 The Vintage Wine Bar has become the after-work happy hour spot for all wine lovers and their friends! If you are not a wine lover, there is no need to worry. Vintage offers a full-service bar with special mixed drinks and more. Hang out with friends inside to watch a game, get in some much needed chat time, smoke a fine cigar, or recruit a smaller group on the porch at a quaint table.